Hill’s Ideal Balance Adult Mini Dog Food is a complete dry food for small adult dogs aged 1 to 6 years. This perfectly balanced kibble formulated for dogs with small jaws contains natural ingredients to help your dog’s immunity, digestion and overall health. This food is grain free and ideal for dogs with food sensitivities. 21% tuna (the lean protein source) and 14% potato along with vitamins, minerals and amino acids to provide optimum levels of nutrients for your dog. Omega 3 and 6 fatty acids maintain skin and coat health whilst strengthening the immune system. This food has no artificial colours, flavours or preservatives. 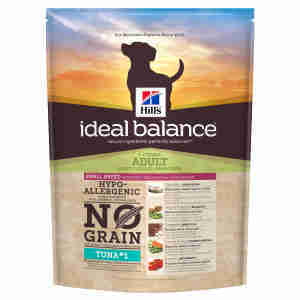 Hill’s Ideal Balance Adult Mini has everything your dog needs to live a happy and healthy lifestyle. (0.2%), dried citrus pulp, dried grape pomace, spinach powder. Potassium 0.74%, Magnesium 0.08%; per kg: Vitamin E 800mg, Vitamin C 130mg, Beta-carotene 1.5mg. Vitamin A 29,212IU, Vitamin D3 1,227IU, E1 (Iron) 270mg, 3b202 (Iodine) 7.2mg, E4 (Copper) 34.3mg, E5 (Manganese) 11.9mg, 3b603 (Zinc) 172mg; with natural antioxidant.